Native Instruments' flagship soft sampler continues to improve with age. We look at what's new in version 5. An instrument open for editing, showing the new Instrument Bus strip. Here, Bus 4 has Transient Master, Solid Bus Comp and Solid‑G EQ as insert effects, plus an effect send. The controls for Solid Bus Comp are shown. The Group feeding Bus 4 has the new two‑pole Ladder filter inserted. 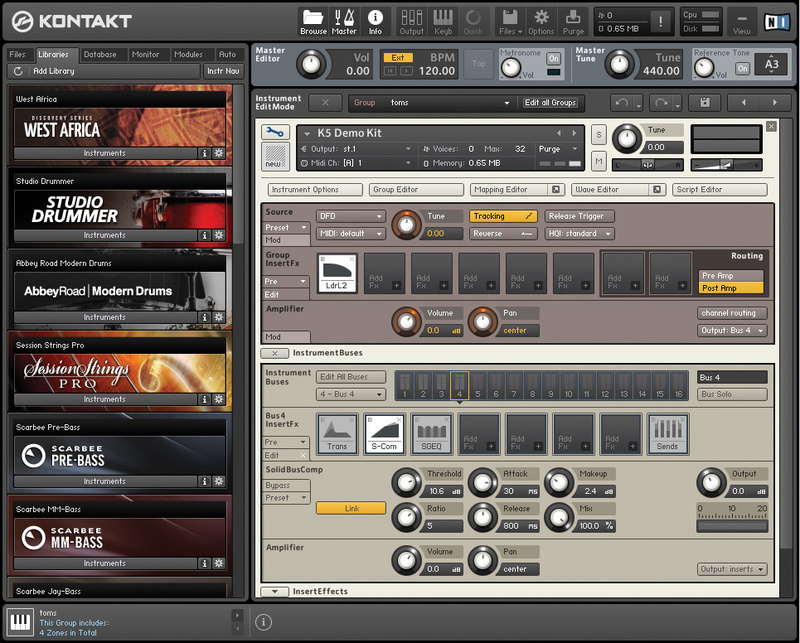 Native Instrument's Kontakt has certainly been a trail-blazing success since its inception nine years ago, and has become the preferred format for a multitude of sample‑based products. Its versatility, flexibility and ease of use make it a very attractive tool for beginners and serious under‑the‑hood geeks alike. From simple one‑shot sample playback to the creation of complex, scripted virtual instruments, Kontakt seems to be capable of pretty much anything to do with sampling. If you're unfamiliar with the software and bemused by all the excitement, you can bone up on the story so far in the following SOS reviews: Kontakt 1 (August 2002); Kontakt 2 (July 2005); Kontakt 3 (January 2008); and Kontakt 4 (February 2010). Just when you were wondering what more could possibly be added, Kontakt 5 delivers yet another bevy of sample‑empowering goodies that you didn't know you couldn't live without. The new version remains cosmetically the same as version 4 apart from a minor change: in Instrument Edit mode, the green colour scheme is now replaced by a shade of pale brown that paint manufacturers might call 'Weimaraner'. Amongst the new filters are three State Variable Multi types: LP/HP Parallel, BP/BP Parallel and LP/HP Serial, each with fully adjustable bandwidth separating the cutoff frequencies of the filter pairs. Shown also is Formant 1, whose Size parameter acts like a gender control, changing the size of the 'vocal tract'. Kontakt 5 adds an impressive list of 37 new filters to the original 16 types, bringing the total to 53. New SV (State Variable) filters appear in the LP, HP, BP, Peak/Notch and Multi categories. NI describe them as the new standard for Kontakt, being cleaner than the legacy filters. The new Ladder filters, which are based on those found in older synths, also offer improved algorithms, together with a High Quality option that applies oversampling at the cost of slightly increased CPU overhead. Especially interesting are the AR (Adaptive Resonance) filters; these adjust the amount of resonance according to the amplitude of the input, acting as a sort of auto‑limiter. You can crank the resonance up full and sweep away to your heart's content, safe in the knowledge that your speakers and eardrums will suffer no harm. In stark contrast, the resonance of the Daft LP and HP filters (borrowed from NI's Massive soft synth) can be pushed into self‑oscillation. By tuning the cutoff frequency to track the keyboard over an evenly tempered scale, you can easily achieve the classic 'singing filter' effect of analogue synths. Four Peak/Notch filters are a welcome addition, useful both for fine surgical EQ and for creating effects similar to phase‑shifting when modulated by an envelope, LFO or the mod wheel, for example. Of the four varieties, SV Notch 4 has a bipolar character: resonance values above 25 percent produce a peak, while lower values produce a notch. Also of special note are two new Formant filters that simulate the vocal tract, allowing you to morph through the vowel sounds all the way from 'ooo' to 'eee'. These will bring a smile of recognition to anyone familiar with the Delay Lama plug‑in instrument by AudioNerdz (the animated singing Tibetan Monk with the inscrutably mobile Roger Moore eyebrows). Whereas Delay Lama was monophonic, had one fixed waveform, no envelopes or filters, and sounded (and I say this with the greatest affection) untameably raucous, Kontakt offers all the facilities you need to sculpt any sample into a musically useful sonic chatterbox. The two variations of Formant filter differ in that Formant 1 is the more severe of the two, with a sharper, more focused effect. For a list of the new filters, see the 'New Filter Types' box. The controls for the Solid‑G EQ. The buttons below the LF and HF bands toggle between shelf and bell curves; both LMF and HMF bands have variable bandwidth (Q) knobs. The sampler engine receives three new playback modes. The most significant of these is Time Machine Pro, a real-time, high quality time‑stretching algorithm that gives you independent control over sample playback speeds and tuning with fewer artifacts than the existing two modes (Time Machine and Time Machine 2). Both of those were capable of producing good results, but it could be hit‑and‑miss, depending on the type of material they had to work with. Looped samples often came off badly (loop points were usually thrown off kilter) and even mild speed variations could sound grainy and distorted, especially when slowing things down. Naturally, I tested Time Machine Pro with a variety of material, and found the results to be variable but generally impressive. Most complex stereo material (such as full‑blown mixes) could take around a speed variation of around 20 percent before acquiring a metallic ring (slower) or a fluttering quality (faster), with sustaining, orchestral music being the most susceptible to artifacts. Percussively oriented material coped a little better with wider speed variations. Nevertheless, the step up in quality from the older Time Machine modes is patently obvious. TM Pro should prove very useful for fine‑tuning the duration of sampled special effects without altering their essential character, and since the speed parameter can be sync'ed to the host DAW's tempo, the speed of pre‑sampled musical phrases will always remain in step with any variations in track tempo. TM Pro offers two-, four- or eight-voice polyphony, and also provides a 'Pro Mode' option, giving control over the formant character of the time‑stretched samples. The Solid Bus Compressor, with its handy gain reduction meter on the right. The Mix knob adjusts from a dry to a fully compressed signal, with parallel compression occurring at all settings in between.The new SP1200 Machine and MPC60 Machine engines aim to reproduce the sound quality and playback characteristics of two vintage drum machines (made by Emu and Akai respectively). Little clarification is given about these modes except that they degrade the playback quality of samples by replicating the sample rate and frequency range of each drum machine, as well as "changing the way Kontakt changes the pitch and basic handling of the sample playback engine”, according to the PDF manual — a somewhat cabalistic explanation. Curious to discover more, I compared the effect of the two engines on drum sounds. The MPC60 engine reveals a significant high-frequency emphasis; everything sounds super‑bright. By contrast, the SP1200 engine's 12‑bit, 26kHz emulation shaves just a gnat's off the top end. However, I didn't observe any obvious change in pitch behaviour, as alluded to in the documentation. Comparing their effect on instrument samples, it became apparent that the loop points of looped sounds were being slightly altered — a click here, a buzz there. Even more interesting were the strange additional harmonics creeping in when playing back sine-wave samples at certain pitches, notably with the SP1200 engine. I can only assume there's some sort of aliasing going on, which no doubt gives the SP1200 its signature sound. The SP1200 and MPC60 engines are clearly intended for one‑shot drum samples rather than instrumental sounds. Aside from the bright quality of the MPC60, any other significant tonal differences when applied to drums (aliasing notwithstanding) were not overtly obvious to me, despite donning my best bat's ears. I'll doubtless be taken to task over this by hordes of angry 12‑year‑old retro drum-machine aficionados. As is the case with all the non‑DFD engines, the entire sample data is loaded into RAM when any of these playback modes is used, so be wary if applying them to all Groups of a RAM‑hungry instrument at once. The Transient Master controls. The Smooth button can provide better results with non‑percussive material. Four new effects have joined the Kontakt fold. Three of these are available to buy as separate plug‑ins, so it's a real bonus to have them included as part of Kontakt 5. First up is the Solid‑G EQ, presumably modelled on SSL's G‑series console EQ. This four‑band parametric design is a great asset, having switchable shelving or bell curves on the lowest and highest frequency bands. Kontakt EQs have always lacked high- and low‑end shelving until now, and using wide Q bandwidths on the high and low frequencies as a substitute has always seemed unsatisfactory and lacking in sufficient subtlety. Solid‑G fills this gap perfectly and sounds, to my ears, cleaner and more 'musical' than the standard Kontakt type, adding gloss, warmth or weight just where it's needed. The Solid Bus Comp appears to be modelled on the SSL G-series Bus Compressor and, again, is a vast improvement on the existing Kontakt effect. Controls for Threshold, Attack (0.1ms to 30ms), Ratio (1:1.5 to 1:30), and Release (100ms to 1600ms + Auto) provide similar functionality to the SSL model. Parallel compression is possible with a simple tweak of the Mix knob, Makeup Gain brings the post‑compression level back up, and a handy gain-reduction meter gives you a visual guide to how much you're pushing things. This compressor sounds good on pretty much anything, and really comes into its own when used with drums. The Transient Master is not a male instructor on a temporary supply-teaching job, but a tool for sculpting the dynamic shape of percussive sounds. There are two principal sculpting controls, Attack and Sustain. Positive values of Attack accentuate transients and negative values soften them. Soggy snares can be given added snap and vigour, while overly spiky guitars can be tamed to sit less prominently in the mix — without the need to alter their levels. Positive values of Sustain lift the post‑transient level, bringing up the body of the sound, while negative values reduce and effectively shorten it. Transient Master is great for rescuing otherwise unusable samples; that plinky piano can be afforded the fullness it lacks, overly ambient drum samples dried out, and polite snares pumped up to in‑your‑face proportions. The Tape Saturator emulates the effect of over‑recording to tape, and is not dissimilar to the Saturator effect from previous Kontakt versions. It adds subtle warmth at low values, increasing to aggressive distortion at higher values with greater amounts of compression. The gentle growl it can impart to organ samples is particularly good. The Warmth control boosts or cuts low frequencies, while the HF Roll-off attenuates frequencies above 12kHz. Oversampling can be applied with the High Quality button. At the time of writing, when Transient Master is applied as a Group insert effect, it doesn't function correctly. Consequently, it should be applied either as a main Instrument insert effect, or an Instrument Bus effect, where it works perfectly. A quick call to NI confirmed that they are aware of this bug, and that it will be fixed in a subsequent service update. The Time Machine Pro engine with Pro Mode active. Pro Mode allows the spectral envelope (formant) to be adjusted with the Env.Order and Env.Fact knobs. The button at the right selects two-, four- or eight-voice polyphony. Perhaps one of the most useful additions to Kontakt, Instrument Buses are to be found nestled between the Amplifier module and the Insert Effects strip. They provide the solution to a perennial problem: how can you easily apply a single set of treatments to a collection of Groups without having to apply them to each Group individually? This is best illustrated with a typical scenario: processing the various elements that make up a drum kit. Take the snare for instance, often represented by numerous articulations — centre hits, edge hits, rim shot, side stick, flam, snares off... you get the picture. Articulations are often assigned to their own Groups, each of which may have its own unique level setting, or possibly an effect of some kind. To adjust the overall level of all the snare Groups, you'd previously have had to insert a Gainer as the last insert effect of every Group, and adjust them all in unison. Similarly, adding effects such as a compressor and an EQ would involve replicating those effects numerous times across all the Groups — hardly elegant or CPU friendly. All this can be done much more efficiently using Instrument Buses. Sixteen Buses are available to each Kontakt instrument and appear as destinations under each Group's output assign button. Once all the snare's Groups have been identified and selected for editing, simply route them to an Instrument Bus. Now the entire Bus's level and pan can be controlled easily from its own controls. Each of the 16 Buses also has slots for eight insert effects, so you only need to add a single compressor to the snare Bus, for example, to process all its articulations. Unlike Group insert effects, which operate polyphonically (ie. the effect is calculated for each individual note), Bus insert effects operate monophonically, just as they would if you were using outboard gear. Effect sends can also be added to each Bus's inserts, so adding reverb to the contents of a Bus is easy. The output from each Bus returns just before the main instrument insert effects by default, but there is also an option to bypass those insert effects, keeping any Bus you choose (and its own effects) entirely separate from the main effects. Armed with the characterful Solid‑G EQ and Solid Bus Comp compressor, the Transient Master and the excellent new Instrument Bussing system, it's now more feasible than ever to produce high-quality tracks entirely within Kontakt, given an adequately wide‑ranging sample library. Sample library developers, too, will welcome Kontakt's extended Script Processor instruction set, which includes a MIDI file player. These improvements might not get every Kontakt user champing at the bit, but for anyone with a passion for tinkering, tweaking and fine‑tuning their sounds, I'd say this is a must‑have upgrade. Besides, with increasing numbers of Kontakt‑based libraries being written specifically for version 5, upgrading may swiftly become a necessity! The following software samplers all feature detailed editing and sound-manipulation capabilities. Their included sample libraries vary in size, with Independence having perhaps the largest at 70GB: Emu Emulator X3 (PC only); Apple EXS24 (only for Logic Pro on Mac); Steinberg Halion 4; MOTU MachFive 2; IK Multimedia SampleTank 2; Yellow Tools Independence Pro; Avid Structure (Pro Tools only). Like its version 4 predecessor, Kontakt 5 comes with a 43GB sample library comprising a generous compendium of instruments in seven categories: Band, Choir, Synth, Urban, Vintage, World and, of course, the essential Orchestral category culled from the famous Vienna Symphonic Library. Further details of Kontakt's library can be read in the SOS Kontakt 4 review mentioned elsewhere. In addition to this, NI's Retro Machines Mk2 library is available for free download once Kontakt 5 has been registered online. This chirpy assemblage of analogue synths, antique electronic pianos and string machines complements the existing Synth and Vintage categories, with the inclusion of some natty parameter morphing, chord sequencing and arpeggiator trickery into the bargain. Kontakt 4 owners may wonder if they need to install the version 5 library, because of both libraries' apparently similar content. I asked NI, who replied that there may be a smidgeon of extra sample data in the K5 library and some instrument patches may have been reworked slightly, although they didn't cite specific examples. Some people may feel it's not worth the installation time and another 43GB of arguably redundant disk space to discover what the differences are, if any, and that's fair enough. The K4 library can still be accessed via K5's file browser, even though it no longer shows up under K5's Libraries tab. Just be aware that if you overwrite any K4 patches from within K5, they'll no longer be compatible with K4. And no, I confess I haven't inspected all the of 1000-plus K5 instruments looking for any differences! Windows 7 (latest Service Pack, 32-/64‑bit), Intel Core Duo or AMD Athlon 64 CPU, 2GB RAM. Mac OS 10.6 (latest update) or 10.7, Intel Core Duo CPU, 2GB RAM. Native 64‑bit support for stand‑alone and plug‑in versions. 1GB free disk space or 48GB for complete installation. 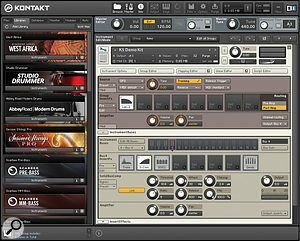 Kontakt 5 works as stand-alone, VST, Audio Units and RTAS (Pro Tools 8 or higher) versions. Although Windows 7 is a quoted requirement, Kontakt has been running on Windows XP (service pack 3) on a 32‑bit machine throughout the course of this review, with no problems at all. Studio quality EQ, compressor and Transient Master effects. Sixteen‑way bus routing on each Kontakt instrument. Improved Time Machine Pro engine. Pristine sound quality and solid reliability. Free additional downloadable Retro Machines 2 library. Kontakt 5 adds 37 new filters, higher quality time‑stretching, two retro drum-machine engines, studio-quality EQ, compressor, transient modelling and tape saturation effect processors, and a highly flexible instrument bussing system to an already world‑beating sampler. What's not to like?